Moving from the party resort of Finolhu to the sister resort Amilla is a contrast. Both luxurious properties appeal to different markets. 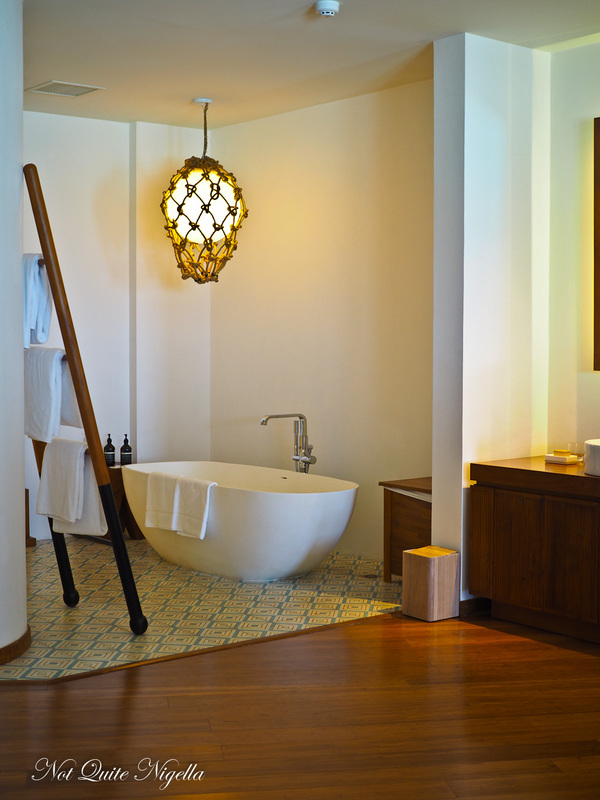 Amilla is in every sense a retreat for the bone and brain weary (making it a favourite with A-listers) and those seeking solace in the lapping waves of the Maldivian turquoise waters. As someone that lives in what seems to be a construction zone in Sydney, I'm not used to the silence. 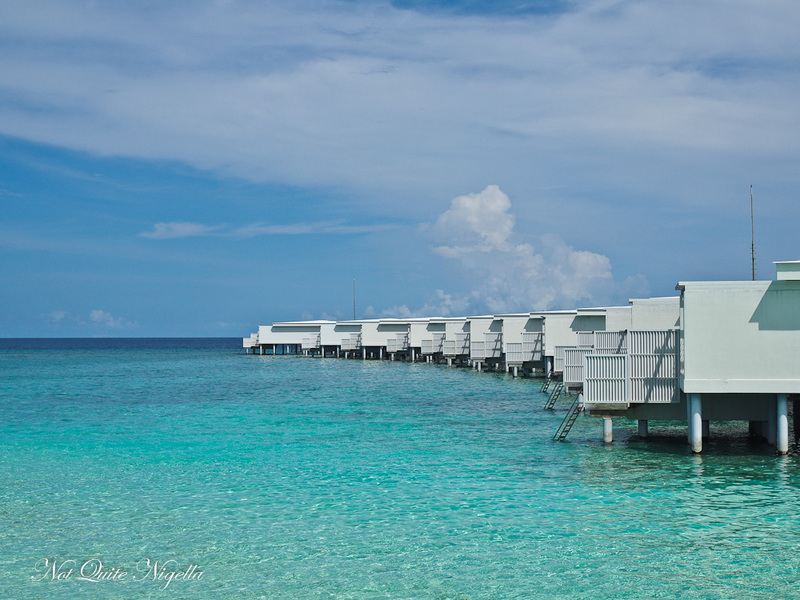 The only sound I can hear is the water lapping at the edge of the over water bungalow I am lying down in. We had arrived here from Finolhu, a 40 minute ride and were greeted by a host of staff who shook our hands and welcomed us to the island. 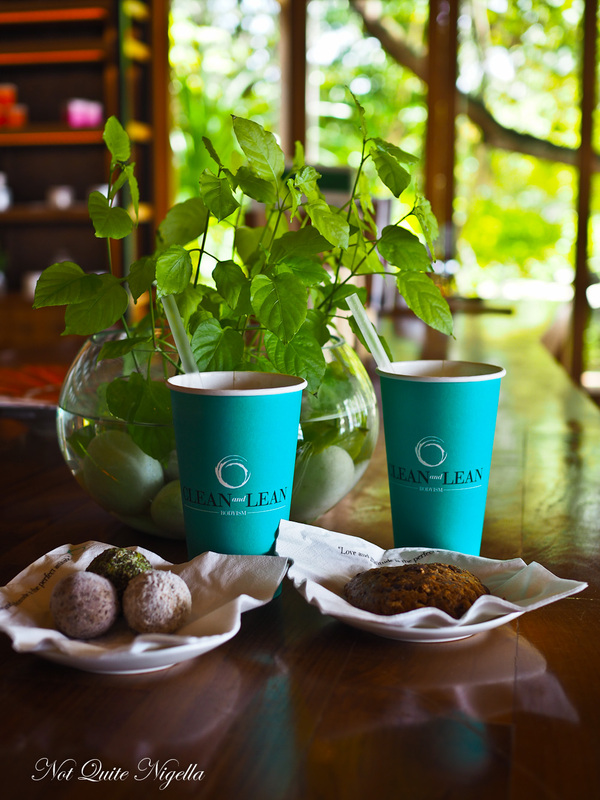 After a refreshing drink we are whisked away in a golf buggy to our ocean lagoon villa. The architecture here is different from Finolhu. 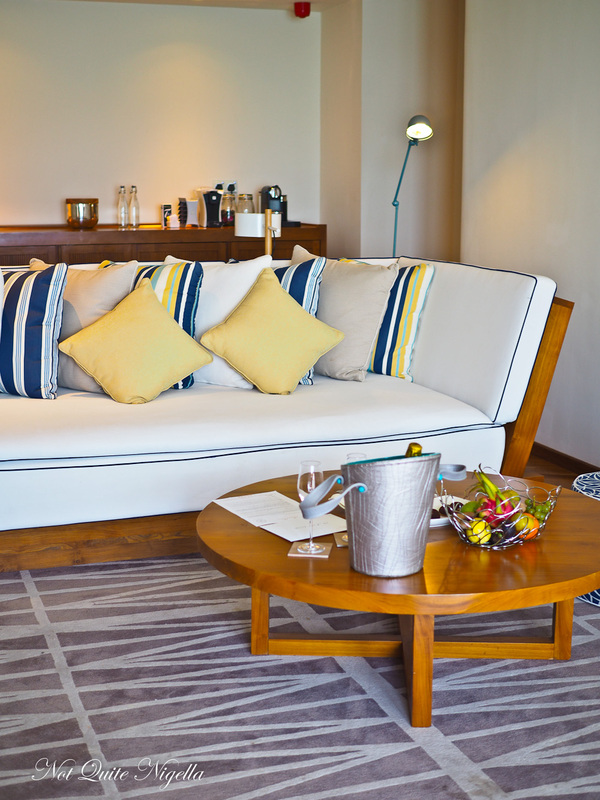 It's sleek and contemporary whereas Finolhu revels and rejoices in fun and retro styling. Key entry is by a bracelet key so there's no fumbling around for keys in your bag and each villa is assigned a Katheeb or butler to assist with anything using the mobile phone provided. Guests can walk, bike or call their Katheeb for a golf buggy. The villas are wonderfully spacious at 230 square metres. They open up to a lounge room with a large day bed, as well as a chair and pouf. There is a fruit basket, custard filled choux buns and champagne on ice. There is a coffee machine but also a tea machine which delights me to no end. As an avid tea lover I make copious cups of tea during my stay. There are half a dozen varieties of tea available, the Earl Grey being a favourite. There's a regular fridge as well as a wine fridge and hidden away is a DVD Blu ray player and an entertainment system. Our Katheeb Jambe shows us the rest of our villa. It flows seamlessly like a spiral shell into the bedroom with its enormous 7x7foot emperor bed with super smooth sheets and downy pillows that just beg a nap of you. There is a recessed wooden desk to do some work but really, why would you? It seems counter intuitive given the setting. 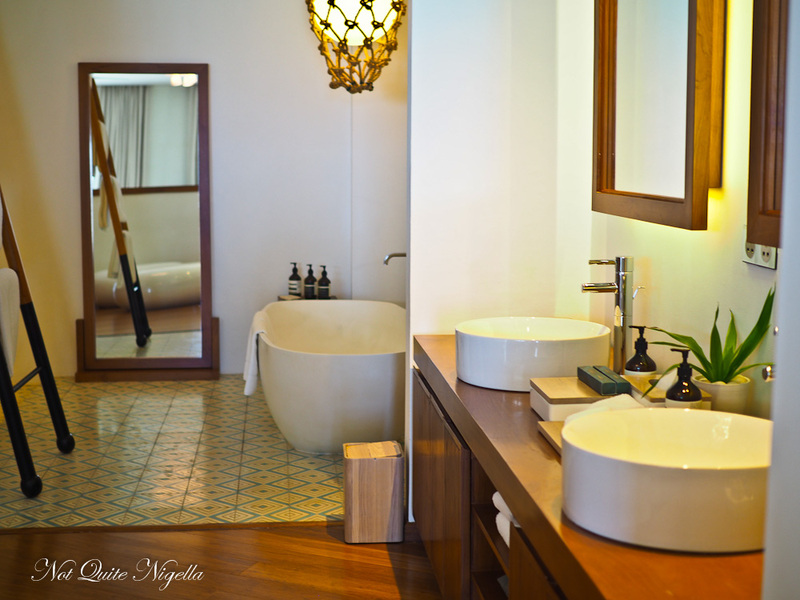 There is a reclining lounge and next to the open plan bedroom are the twin sinks with Aesop products as well as a box of amenities including cotton pads, cotton tips, dental kits, shower cap, sewing kit and nail file. Another inclusion is the complimentary photography session but there was no way that I was going to get super camera shy Mr NQN there. Jambe shows us the shower room which is a spacious room with a free standing bath and a dual headed shower with an enormous monsoon head as well as a large seat to rest on if you so wish. The toilet is in a separate skylit room. There is plenty of closet space with a safe, robes and slippers and there is a complimentary laundry service with 5 pieces cleaned per guest per day. Internet is fast and free and good enough to stream movies or tv shows. And then there's the outside area. 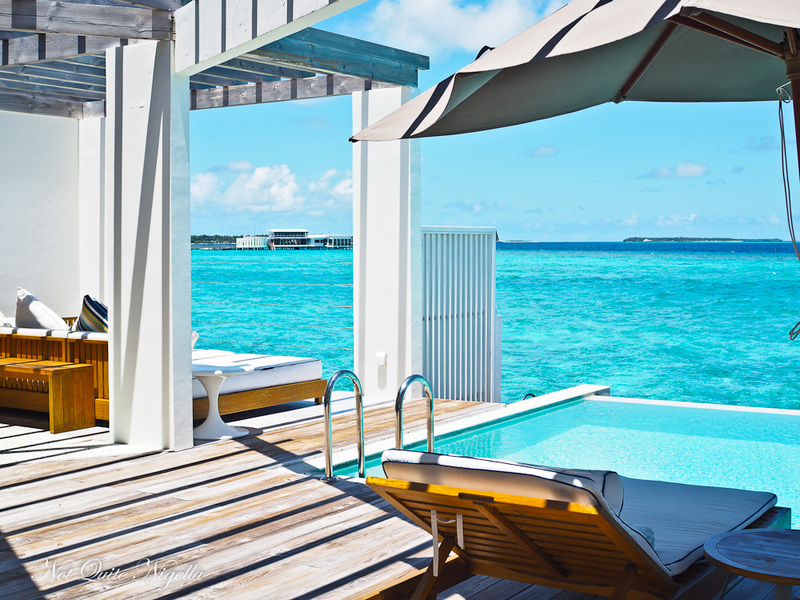 Each ocean lagoon villa has its own private freshwater pool, cushion filled day bed, two chaise lounges, an outdoor shower and direct ocean access. 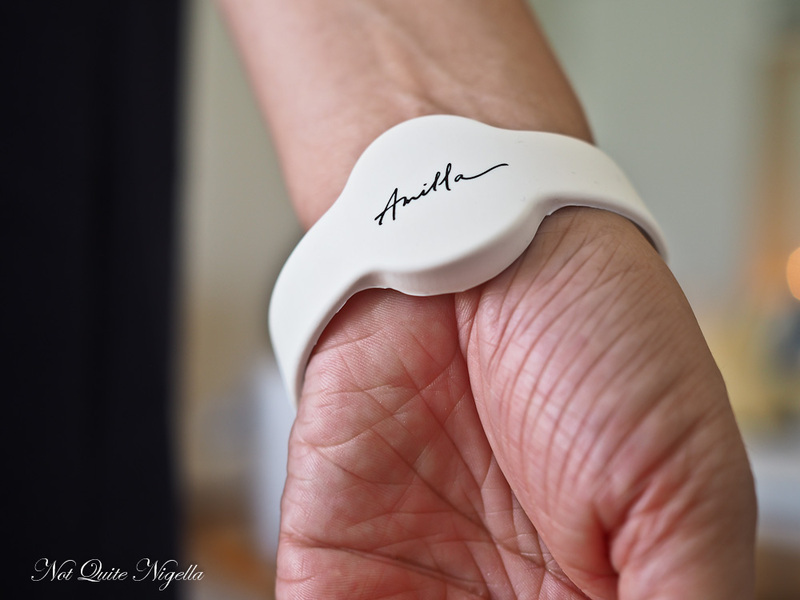 Another feature of Amilla is the wellness and fitness program called Bodyism. 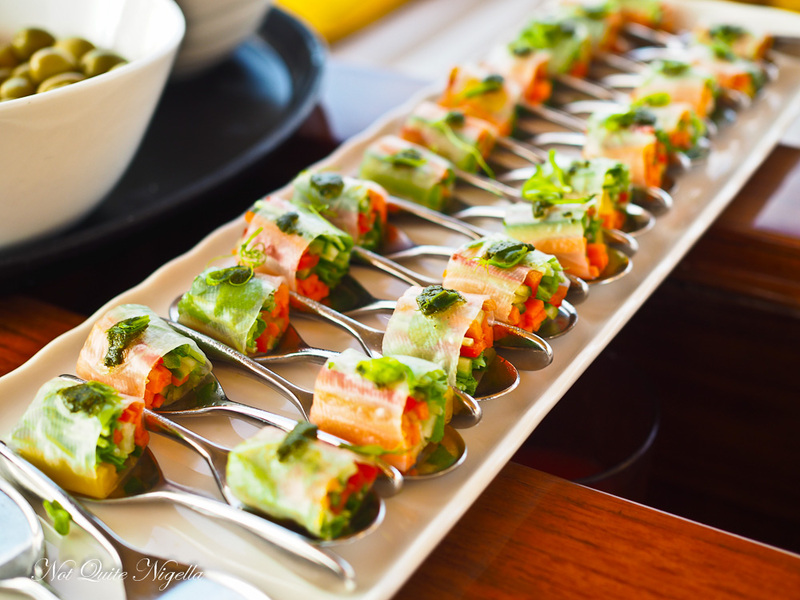 There was a reason why I brought along so many loose clothes and the food has been so good and the bread baskets and extra courses so plentiful that it's perhaps a canny measure to help out those guests that have taken to the sumptuous meals with gusto. Who me? Bodyism is a collaboration between the resort and Australian born fitness personality James Duigan who trained Elle Macpherson among other celebrities. For those staying in the treehouses there is easy access to the Bodyism program which involves fitness training, shakes and healthy food. For those in other accommodation it is a little less clear how to access these offerings or at know that they are there as they are only available at this very quiet part of the resort. While they appear on the room service menu they aren't branded as such. I became addicted to the wheatgrass shots at breakfast which I don't usually like but I didn't know it was part of the Bodyism program. If you do feel like training with someone, you can book a session with performance specialist James Burke at the Bodyism Studio located behind the Javva spa. The training sessions for singles or couples involves stretching and exercise in the air conditioned studio based on individual needs. The sessions end with a protein shake customised to you - I get the Body Brilliance shake while Mr NQN's gets the Protein Excellence. For all of their supplements they use vegan protein sources like brown rice and green peas. There are also energy balls and healthy cookies made using pumpkin and cashews as a base plus a scoop of the supplement (tip: the green one is the tastiest). 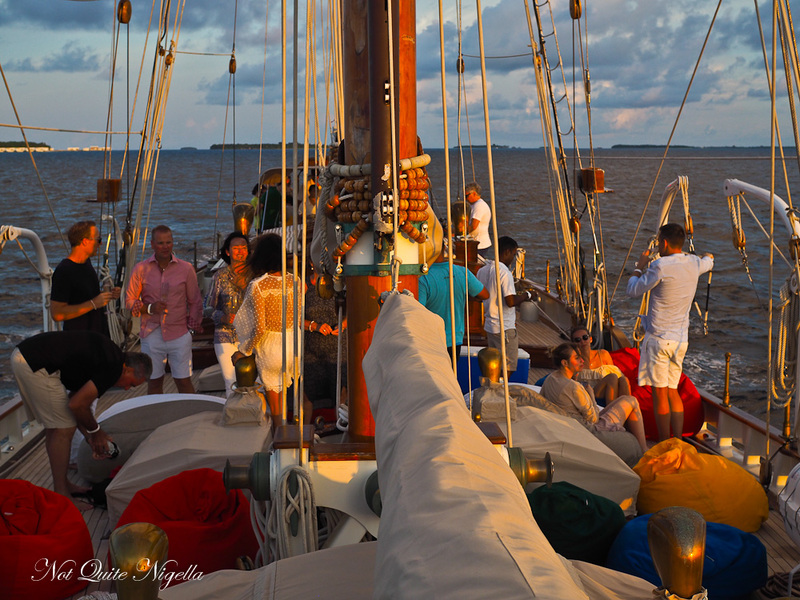 At 7:15pm we are picked up by Jambe as we have been invited on a sunset cruise. We board a speedboat that takes us out to the Lady Thuraya. 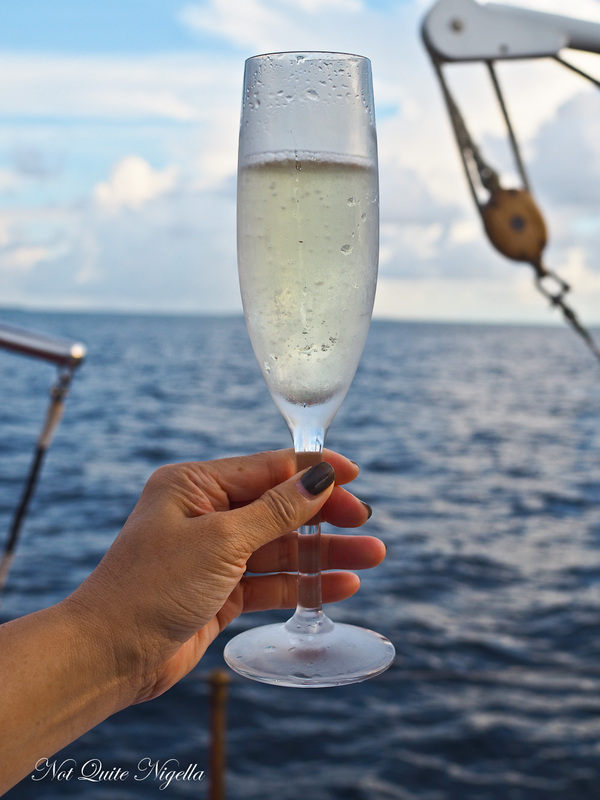 We are served glasses of champagne and canapes and are invited to watch the sunset and explore the lower deck. 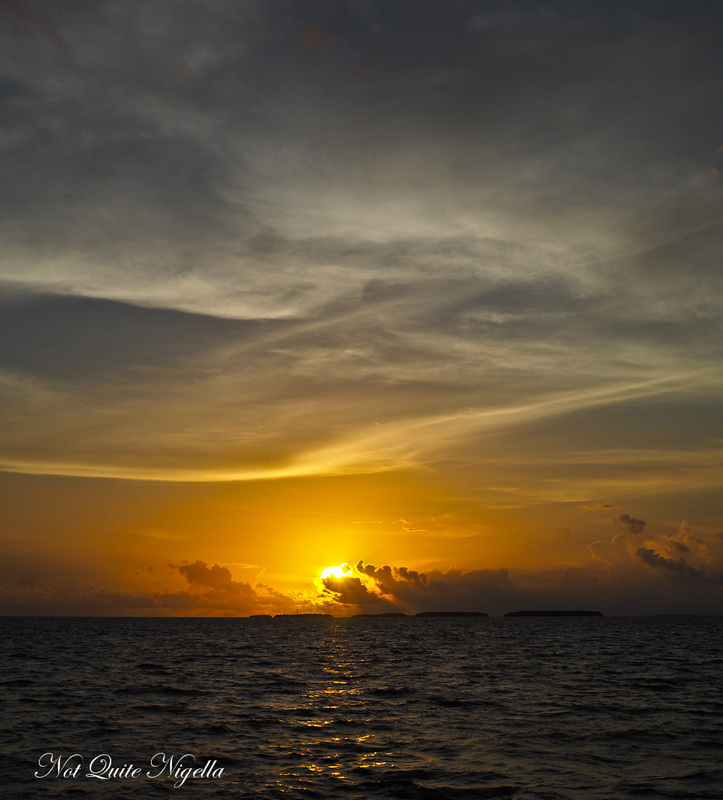 The sun sets in the distance and the boat returns from exploring the atoll around 9pm. It's time for dinner and Baazaar is the food area with several restaurants that serve different types of cuisine from six restaurants. We sit down at Barolo, the Italian restaurant with a lovely Australian/Canadian couple that we met at Finolhu called Matt and Cristina. We order a range of dishes from Wok as well as Barolo. 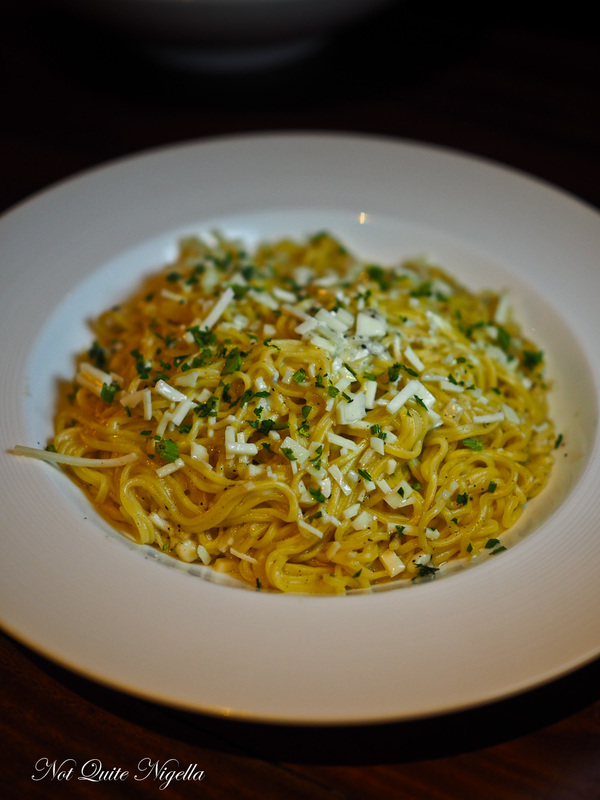 The cacio e pepe pasta isn't quite what you would expect, the pasta is soft as noodles although I have to cut them some slack as we are quite far from Rome. The best entrees are actually from Wok. The pho is delicious and made by their Vietnamese chef. 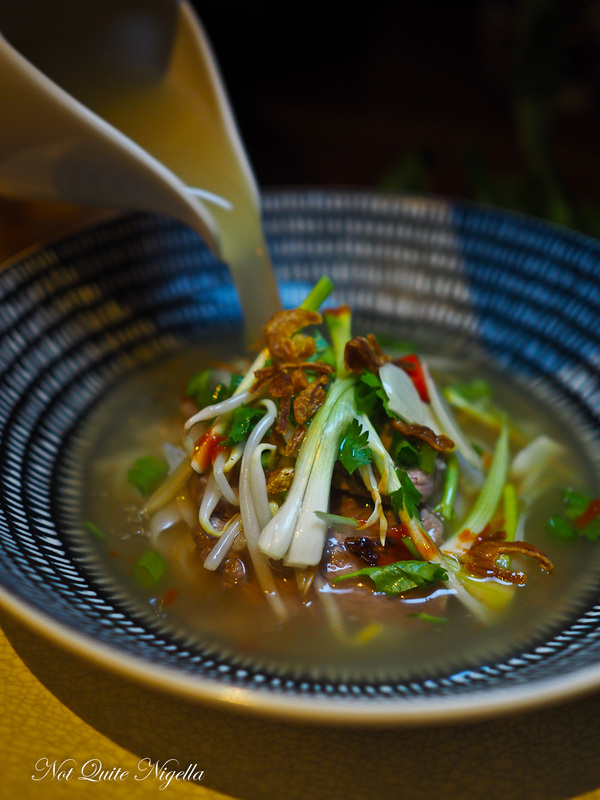 The broth has a wonderful flavour and we tangle with the slippery noodles and share. 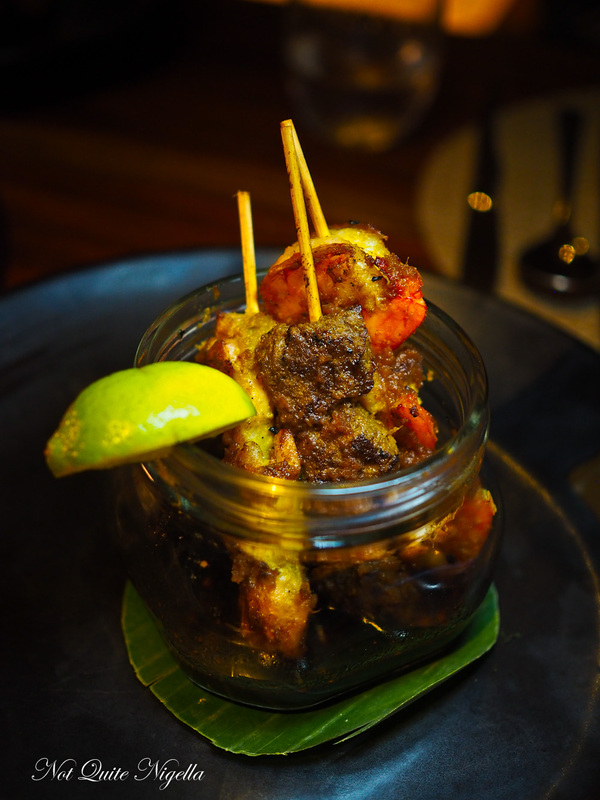 The prawn, chicken and beef satay sticks are very tasty and come served in a jar with sauce and coated with peanut sauce. 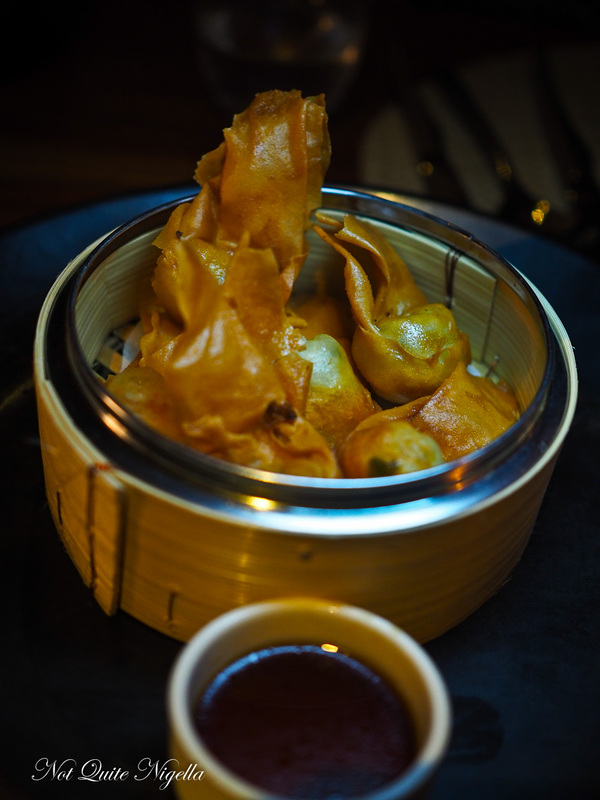 While the fried wontons are a real favourite at the table too with succulent prawns inside crispy wontons. Our waiter is fabulous making many recommendations for us. 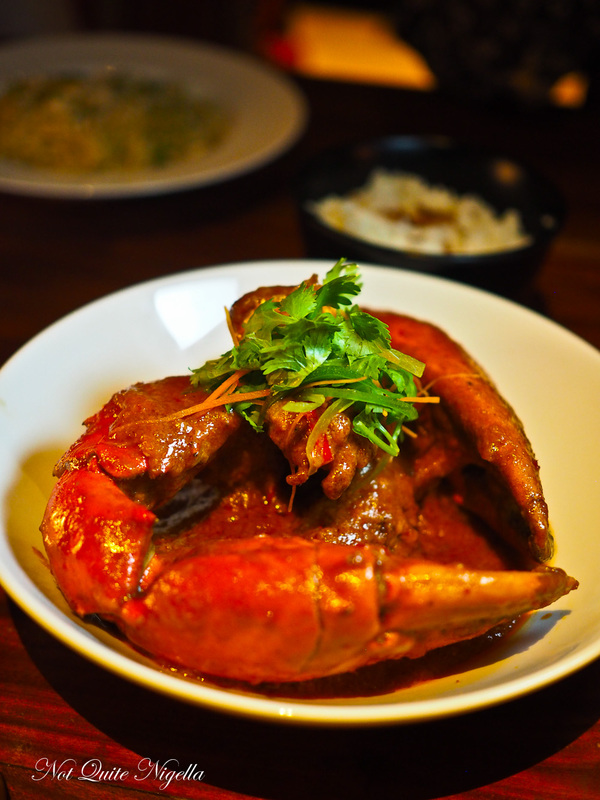 There is Sri Lankan crab as well as chilli crab but since we already tried the Sri Lankan crab we go for the chilli crab which is a sweet Asian style crab with plenty of meat. The crabs are bought over from Sri Lanka and the claws are enormous and meaty. The striploin is juicy and cooked medium rare just as requested and we get a side of fries with it. These are a bit dry, almost like baked fries and we wish we had tried the truffle fries instead. 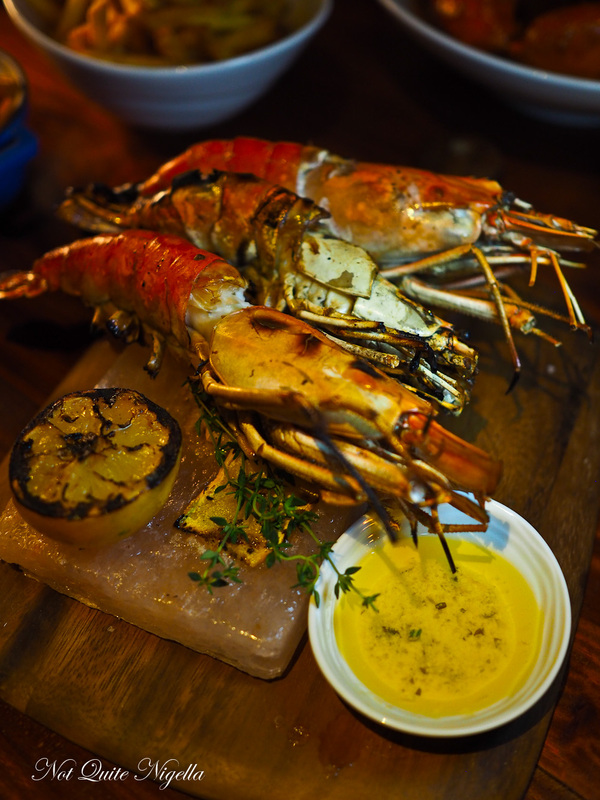 Another favourite main is the freshwater prawns which come as three enormous juicy charcoal grilled prawns. 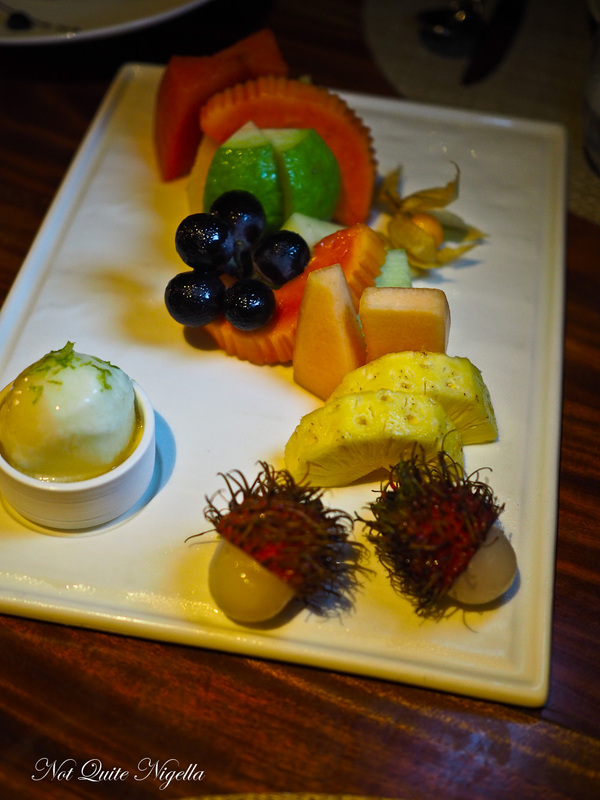 The fruit selection is excellent with plenty of tropical fruit from rambutan, pineapple, red and yellow watermelon, melon and grapes. These are served with a scoop of lemon sorbet. 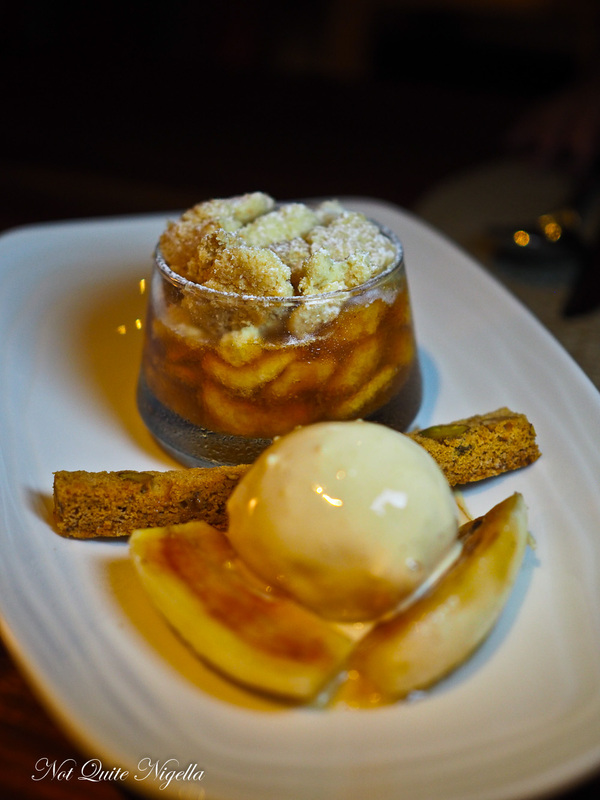 We also love the banana crumble with a scoop of salted caramel ice cream on the side with slices of toffee banana. 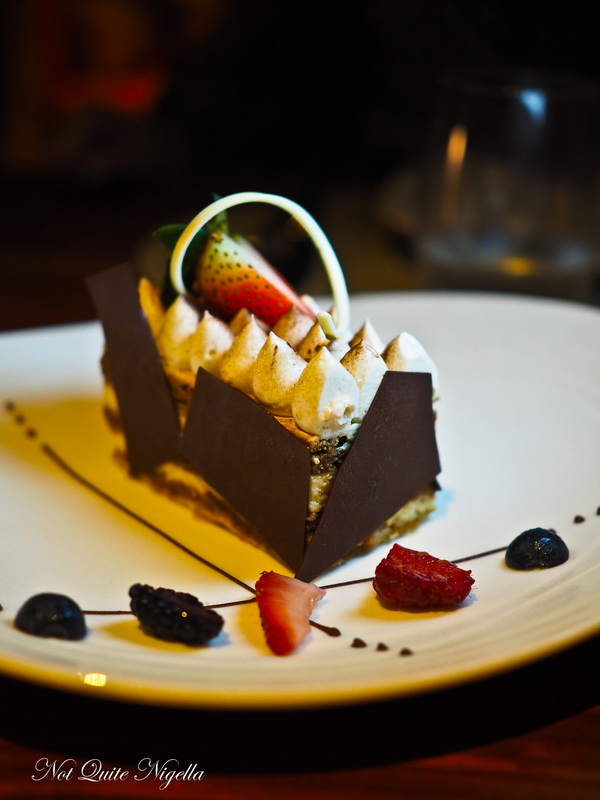 My favourite dessert is the tiramisu. I didn't realise that it was a tiramisu until I took a bite of it but it's the perfect combination of sponge, mascarpone and coffee. I can't stop at one bite. 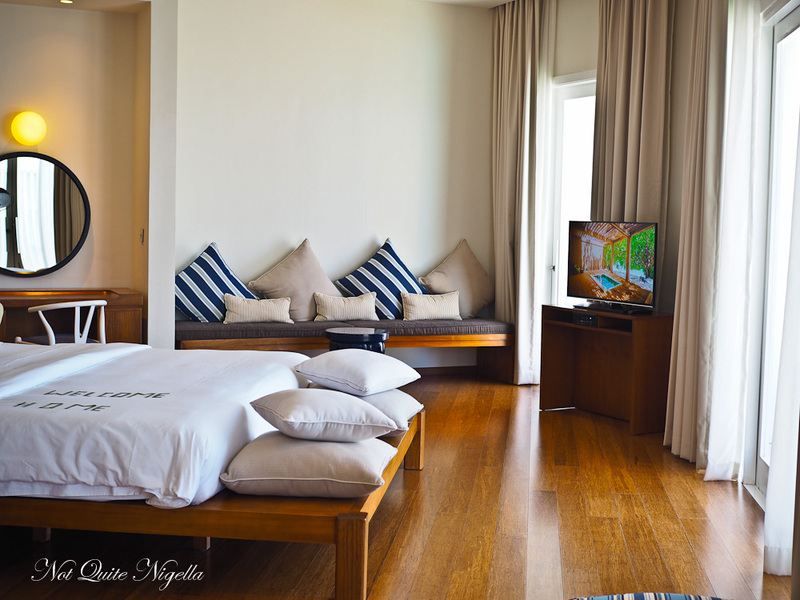 Sleep comes easily on our first night at Amilla. No surprise given the enormous bed, luxurious sheets and the sounds of silence. So tell me Dear Reader, do you ever find silence a bit jarring (even at first)? NQN and Mr NQN stayed as guests of Amilla but all opinions remain her own. Take a look at the Not Quite Nigella exclusive package deal for Amilla where the two of you can stay for 4 nights from just $3,470USD (plus taxes). Reserve your package today by emailing stay@amilla.com with your name, dates, promo code "AMILLA-NQN1" and your preferred room package. Click here to download a pdf of the various packages for Amilla on offer. 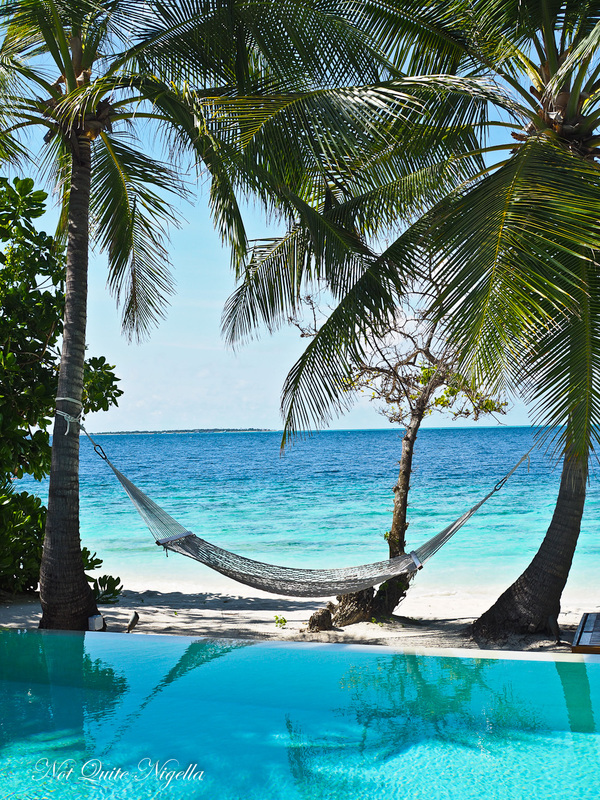 travel3 Amazing Maldives Resorts & Tips On How to Make The Maldives More Affordable. Plus 2 Exclusive Travel Deals! 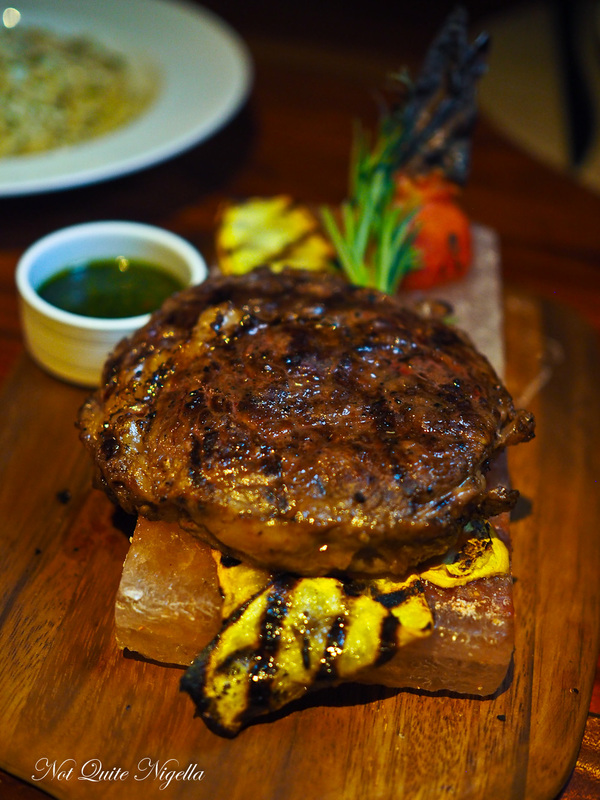 travelMaldives Diary Day 3: Gordon Ramsay's Bread Street Kitchen Comes To The Maldives! travelTen Secrets & Tips For Amazing Travel & Portrait Photographs From The Experts!